Can you smell the crisp, autumn air? We are experiencing the first signs of fall in the northeast. Cooler weather brings changing colors, leaves falling, holiday planning, family friendly fairs, pumpkins, and cozy nights by the fire pit. These are a few of our favorite things! At Belknap Landscape, we love the changing seasons and helping our clients enhance their autumn landscape. 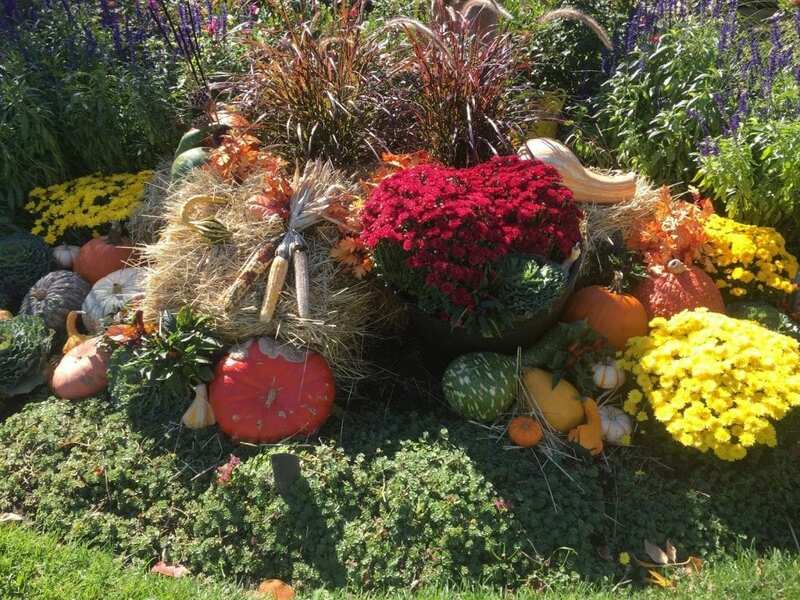 Pumpkins, gourds, mums, corn stalks, and bales of straw are just a few of the fun elements that can compliment your best natural fall look: the surrounding foliage. Whether you have a large property, small cozy home, office window boxes, or classic entry, adding seasonal color and texture can have a wonderful impact for your property. Invite guests over to sip on a warm cup of cider and enjoy the picturesque landscape next to a beautifully decorated fire pit. Come home to a bounty of seasonal flowers and strategically placed gourds. Replace cold sensitive plants and flowers in your garden bed with more resilient options like kale, mums, pansies, and aster. Get ready for fall open houses and leaf-peeping visitors to the lakes region by sprucing up your office or retail space with a punch of fall color. If you don’t have space in the garden bed for additional plants, you can update patio containers and decorative pots with your flower of choice to add that pop of color. Balance and effect are very important when decorating for Fall. A few small elements may be the perfect touch for a small entry or office window box. If the landscape lends itself to more decor with walkways, lamp posts and walls, having fun with pumpkins, corn stalks and kale can bring the spirit of fall and the upcoming holidays right to your doorstep. Don’t stop enjoying your outdoor space just because it got a little chilly. Put on a warm layer and make the absolute most of the changing seasons. Create a landscape for you and your family that will make this year’s autumn season one to remember. If you would like some help making this possible, we would be happy discuss ideas that match your style and passion.